Well, well, well what can I say. From October 23, 2015, everything has been about April 3, April 3, April 3. And now April 3 is finally here, and I don’t know what to do with myself. Actually there are many things I could do. I could write a much needed blog post for my MLB Toronto BlueJays Blog (which I’m doing right now), I could scream in excitement (although I’d rather save my screams for yelling “Boo-yah” with my mom when we hit our first homerun of the season), I could be tweeting to my 450 Twitter followers (OMG 450, still not used to saying that), or I could be thinking. Which (for now), is what I’ve decided to do. The truth is, it’s currently late at night on March 31 (I’d prefer not to say the time because my parents follow this blog, I promise it’s not too late!). I believe that I think and write the best at night, I’m a true night owl! To this post right now, I’ve been involved in an amazing community. I’ve made so many new friends and I’ve created an account that I’ve been able to share my BlueJays passion with. It’s been amazing! I was not always a HUGE BlueJays fan, like I’m now. I used to watch the occasional game. For example the Home Opener, Canada Day and the last game of the season. It was really just a fluke that I became a fan the one season that we made the playoffs since 1993. It really was. The BlueJays were always (and I mean ALWAYS) on my main TV screen. My parents watched every game last season and all of the previous ones. As I’ve shared before, my mom was at the 1993 winning World Series game when Joe Carter touched more then all of the bases, he touched people’s hearts. And although I wasn’t alive then, I believe I can understand the feeling. When going to my first BlueJays game with my cousin Jordan, and his fiancé, I felt something special. My mom being a huge fan, and my cousin being seasons tickets holders for since I could remember, meant that at some point or another I would become a huge fan. Well, the time finally came that day. My cousin had always talked about taking me to a game with him. For all of us it was that kind of thing that we would always say but never do. When he asked me to go with him, I couldn’t say no. I was brought up in a family of sports and BlueJays fans, and besides that I REALLY wanted to go to a game, just to have fun! So I went with him and his fiancé that day. My mom at that point had not been to a baseball game for as long as I’ve been alive, and I was so excited to tell her all about it when I got home! Walking up that big ramp to the 500 section was a dream, I remember having a big adrenaline rush just thinking about how much I’d been waiting for this moment to come. As I walked outside to see the stadium, I thought I was in a dream. Seeing so many people supporting a team with a passion was unreal, and I knew I had to be a part of it. The rest of that day was amazing, greatness at its best. We won that day, and I even saw José Bautista hit a homerun!!! I came home that night telling my parents I had the best day of my life. And I believe it was just that. I don’t think many moments will ever come close to that. I started watching games daily with my parents, and I learned the rules of baseball and exactly where each position was. I learned all of the players names, and I learned about the coaches and front office staff. I started tweeting along with the games just for fun, but it wasn’t until around July that I realized that there was a HUGE MLB Twitter community! I started tweeting and interacting with other people, and that’s when my account blew up. I remember hitting 200 followers and thinking that was crazy. I still can’t believe that I have more then triple that amount to this day! My parents and I ended up going to two additional games this season, and they were a dream come true. The funny thing about this year was that if we didn’t make the playoffs, even if we were the worst team this year, I still would’ve loved them. Making the playoffs and winning the division was just an added bonus! Don’t get me wrong, I’m so so so happy we made the playoffs, and I truly think we are going to win the World Series this year! I’m not just saying it, I promise. But if none of that would’ve happened, I still would be a huge fan! But the cards just weren’t in our favour. The one thing that really struck me about that series I actually just found out in January. Marcus Stroman would’ve pitched against Jonny Cueto for Game 7, and I think we would’ve won that game. I know we would’ve won that game. Well, I guess we’ll really never know for sure. This offseason has been spectacular! Full of twists and turns and interesting events! Although we didn’t manage to pull off anything that great, the tweeting was awesome! I interacted with so many awesome BlueJays fans/tweeters, and it made waiting for April 3 a little less painful. Spring Training games were so fun to live tweet, just like during the regular season. Although, I was running errands or at school for most of them! If you didn’t already know, we finished first in the American League, and 2 in Grapefruit League (a few games back to the Washington Nationals). And now the day we’ve all been waiting for is finally here! I’d like to personally thank all of you for following my blog, of following me on Twitter. I’ve had so much fun on them, and I don’t know what I’d be doing lately if it wasn’t for tweeting about the BlueJays. 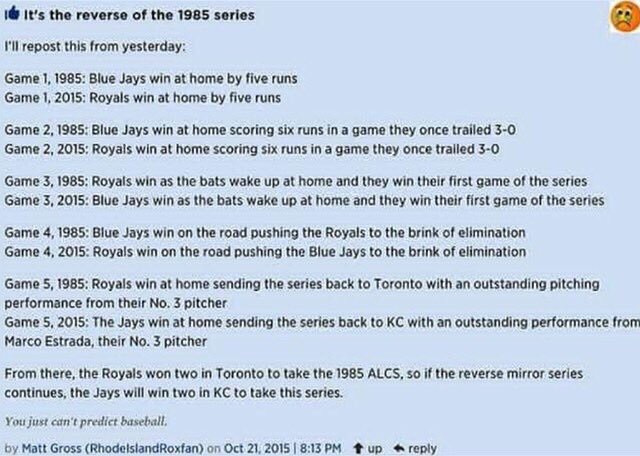 I know that this season will be one for the books, and I can’t wait to celebrate with you all in a blue coloured parade downtown after we win the 2016 World Series.